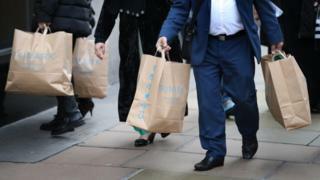 Government plans to relax Sunday trading laws in England and Wales have been put on hold, after SNP opposition meant it faced defeat in the Commons. The SNP had said it would vote against the changes amid fears it could drive down Scottish workers' wages. With other opposition MPs expected to join forces with some 20 Tory rebels, the plans would have struggled to pass. The BBC's James Landale said the idea had been parked while talks continue with opposition parties. Angus Robertson, the SNP's Westminster leader, welcomed the government's "U-turn". He told the BBC the party supported Sunday trading but not "on the back of often lower-paid shop staff", and said it would be "open to discussions" on how to ensure safeguards. Downing Street said there had been "absolutely" no U-turn on the policy. The prime minister's official spokeswoman said the next steps would await analysis of the results of a consultation and be made clear "in due course". Image caption Mr Robertson said he was pleased that the SNP's presence at Westminster was having such a "beneficial effect"
Chancellor George Osborne promised in the Budget earlier this year that councils and mayors would get the power to set Sunday trading laws in their areas. Large stores and supermarkets can currently open for only six hours every Sunday. Although the legislation affects only England and Wales, the SNP had been convinced by shopworkers' union Usdaw that retailers would pay for the extra hours by cutting wages across the UK - including those of Scottish workers currently being paid premium wages for Sunday work. Mr Robertson said the government would have to go away and think again about its proposals. "We want safeguards, we want guarantees, we want to make sure that shop workers in Scotland and the rest of the UK are not worse off," he told the BBC News Channel. The government launched a consultation over the summer to look at the changes which are designed to support High Streets and shopping centres by allowing them to stay open for longer at weekends and compete with internet shopping. Shops in Scotland already have more freedom because the Sunday Trading Act does not apply north of the border. Government sources pointed out that Scotland already controls its Sunday trading rules and the SNP was once again trying to block something that had no impact on their constituents. They said the SNP move once again made the case for the government's recent changes to parliamentary rules that gave English and Welsh MPs greater control over laws that affect only their constituencies.